Enchiladas recipe by hotline_hl at PakiRecipes.com. Boil chicken in water with salt n black pepper . Shred it. Then take a pan and put 2 table spoon of oil. Now put 3 tab spoon of pasta sauce n chedder cheese . Wrap this chicken in tortillas. Now take a baking pan, make a layer of pasta sauce. Make a layer of sauce n chedder cheese. Bake it in oven at 350 F for 15 minutes. 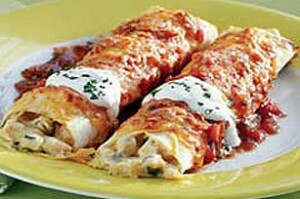 Delicious enchiladas are ready to serve.